As I mentioned at the first of the year, I plan to spend 2010 immersing myself in Charles Swindoll's Great Lives Series as a way to more fully engage with scripture. I've owned this series for some time and have read about half of them and I figured that making a public declaration about reading the books would help me to actually do so. This month I wanted to spend time learning about and learning from the life of David . (This is one I HAD read before but needed to re-read.) At 320 pages it's not a quick read and it's not an easy read. However, it's not easy because Swindoll draws from the life of David to teach practical life lessons, not so much because of the length of the book! My copy has post-it notes sticking out all over it. I really haven't the foggiest idea of where to start. Swindoll begins at the beginning with David - in the field with the sheep. 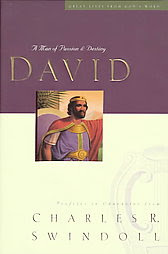 He walks us through David's life from brave young shepherd to successful (and sinful) king. I think the best way I could go about sharing this book and what I learned from it is to first take something that Swindoll said and then share my personal application. That will be the format of this particular review series. On David being selected as king - even when no one seemed to understand why. David was not any person's first pick for king. His own father completely forgot to call him in from tending the sheep so that Samuel could meet him!!! Saul, on the other hand, was a natural choice for people to make. He was tall, dark and handsome. David smelled like sheep. But God looked at the inside. He found favor with David. For me, this was a reminder not to listen to what others may occasionally think or say about me. It is admittedly easy to focus on the messages that other people are giving to me and about me. Even though I am typically a person who knows my own mind, words can still hurt (just like they hurt anyone else). I've worked too hard and too frequently, to try to make too many people happy (all at the same time, no less!). I've forgotten about the most important relationship I could ever hope to have. The most important thing I can do in life is cultivate my relationship with God and establish a right relationship with him. If I do that, then all other relationships will fall into place where they can and should be. I had made a lot of other things a priority in my life and reading this was a wake-up call (a gracious reminder?) that God really isn't listening to the opinions of others. He is about Himself. So I need to be working on having this right relationship with God and it isn't anything that anyone else can do for me. The responsibility is mine and the work is mine to do. On parenting wisely and well. I have never once given deep consideration to Jesse's failure to call David in from the field but now the example is just downright crushing and painful to think about. As a mother, these two sentences might have done more for me than anything else in the book! I don't want to ever be a Jesse. I never want to be accused of playing favorites between my children. I want to 'cultivate a mutual self-respect' among them so that they learn to love one another, respect one another, and stand up for one another when life becomes more than just a little interesting. I recognize that that will not be developed solely by my human efforts, although at the same time it will require self-discipline and an awareness of my own actions and words on my part. I'm not exempt from responsibility but my prayer is now that the children we have will respect each other fiercely. I read what Swindoll said of Jesse and I thought to myself, "Wouldn't it have been awesome if one of David's brothers had reminded his father of David's existence?" Apparently their mind was on themselves as well. Again, man looks at externals but God is focused on internals. That's where our focus should be also. On following God's design for my life (and my life only), assuming nothing of others. I would say that God has been driving this point home to us over the course of the past couple of years. The challenge though is to accept that God moves in different ways for different people. (There is a difference between knowledge and acceptance.) We're each different. I'm not saying "to each their own" in life but I am saying that we I need to learn to look around and accept that people are in different places according to God's will and what He is working in them. I know that that's true for me, right? I totally feel the pressure when someone is approaching me with their armor, shoving my arms into pieces that don't fit and slamming helmets down on my head, and then being frustrated when their suggestions (and sometimes demands) aren't working for me. It's such a loathsome experience. I'm sure you know what I'm talking about because no doubt it's happened to you as well. But how often do you turn around and do the same thing to others? Yeah. I'm asking myself that same question. As I said, I have a whole lot of post-it notes to go through here but I don't want to risk losing you in the midst of them all. Suffice it to say, this was a good and valuable book for me to read. I hope that if you haven't read this series, you'll choose to do so soon. I have learned so much. Some of it I really didn't want to learn. Some of it will be a long work in progress. Thankfully though the message of David's life is also this - his life WAS a constant work in progress - from birth to death. It was that way because that's the way God is. "When God develops character, He works on it throughout a lifetime. He's never in a hurry." ~ Charles Swindoll, David. The ultimate lesson? Never let your guard down! Be vigilant in your relationship with Jesus Christ. Continue to develop and nurture it. Be about the things that God is about and long for a heart that is like His. I'm not here to say I've got it all down. I really do not. I'm only here to point you to a resource that was beneficial to me -- for this long term life project I've got going. This post was originally posted as a giveaway. The contest is now closed. Sherry at Semicolon has chosen Esther of this series as her book club selection for January, so I HOPE to find a copy and join in. . . I think this would be a great book/series to go through with my teenagers. I've been intrigued by this series but never read any of the titles. I'd love to try! Please enter me:) Would love to win this!! Thanks!! This sounds very interesting. I'd love to read it, give it to hubby and then discuss it. Please enter me, I would love to try this series. This looks like a great book. Count me in! ahhh, the simplicity of leaving a comment on a chance of winning a book! I have been following your blog for about 6 months or so now and I REALLY appreciate your reviews. I have purchased Choosing Gratitude which I am currently reading. I also picked up my old Anne of Green Gables volumes and started with the first book again after 20 years of not reading it and about 12 years of not seeing the movie! Oh, what joy to get together with my dear childhood friend, Anne! Now I am going to have to pick up David! Hopefully with a copy I win, but if not, I'll go out and buy it!!! Looks like a very valuable book! Somehow I didn't enter this before when I read the review the first time. It sounds too good to not enter! Great review.David sounds wonderful.Please enter me in the giveaway.augustlily06(at)aim(dot)com.Thank you. This book is one that I would love to have for my husband. He would love this. I so hope I win. I've got a copy of another book in this series about Esther, I think, that I need to dig up and read.